Jodi Thomas on the radio show! Jodi Thomas is the NY Times and USA Today best-selling author of 26 novels and 6 short story collections. As of July 2006, she was the 11th woman to be inducted in to RWA Hall of Fame. She is also currently serving as the Writer in Residence at West Texas A&M University in Canyon, Texas. Tune in to INTRODUCING WRITERS! and help me to celebrate Jodi's latest release, Rewriting Monday. Today I gave my first presentation at a local school. It was something arranged a few months ago at a school about 25 miles away. I have sent out a total of 25 packages, containing, letters, flyers and information details, and in the case of my local schools a hard copy of the book for their library. I received a total of zero replies, not a letter, email nothing… Thank you schools! She's posted an excellent blog "Book of the heart or book of high concept? Why not both?" If you have time, please check it out. How do I find my Purpose /Passion? Is it a feeling? Are there questions that I can ask myself to arrive at this conclusion? A quick blog post to remind you that you can get your paperback copy of Is That Really Me? at wordclay.com Simply click on the link to wordclay that is highlighted in this post, at the top of the wordclay page in the search bar enter Hendrick (my last name) it will take youstraight to the page that the book is located on. I’ve learned when it comes to events, people will attend if they want to. Let’s talk about the hot topic of the last week the Christian Book Expo. They set up this wonderful expo and the readers didn’t come. I try to stay in communication with all of you on a regular basis. I hope each of you find blessing and joy this day. Fourteen chapters highlight Washington food festivals and event through out the year. There are over 180 recipes utilizing foods grown in Washington. The book includes several recipes from local, professional chefs. Visit Washington, and take a bite home with you! chartered to adequately represent and serve the King of Kings in all of your dealings. Today I have from sources and people received some helpful links both for bloggers and for writers. There are a few so I thought I’d share them with you. Carolyn Howard-Johnson (@FrugalBookPromo) and Phyllis Zimbler Miller (@ZimblerMiller) are hosting a tweetchat for everyone interested in learning how to write a book proposal. Use the hashtag #bkpro to join the conversation. 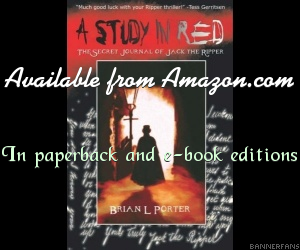 Brian L Porter’s ‘A Study in Red – The Secret Journal of Jack the Ripper’ Reviewed by Lutz Barz,(RS Publishing). After hours of working and writing, I become spent. I come home and have dinner with my wife and kids. I will then proceed to the living room where my computer sits. I the check my e-mails and whatever else comes to mind. Finally, I like to go over to my T.V. set and turn on the Wii.